This is the 13th book similar to the Walking Dead but in my view is just as good if not better. The storylines in each book intersect and i am now hanging ln waiting for the next book. I binge read all 13 in a matter of a week, i just couldnt stop reading. I have just generally liked the series and am awaiting the next one in the series. Excellent Book, as were all in the series. Cant wait for the next one! I just finishing Frank Tayell's Future's Beginning, Book 13 of his great Surviving the Evacuation series. I have to say that even with Bill Wright not in the action focus, this is a great read. The apocalypse survivors are divided among a couple of groups after having left Angelsey. Sholto has effected a discovery of saboteurs but their handiwork has brought a conflagration and another zombie invasion, so his group must leave Belfast. Kim's group is leaving Dundalk and heading onward across the Irish Sea. I won't leave any spoilers, but will say that the action and mystery are in abundance. Tayell has once again given fans a good action and mystery story set in a zombie apocalypse. Characters we've grown to know and appreciate continue to prove their flexibility and intelligence amid horrors and mayhem they never asked to see. I sure hope that my #1 British contemporary writer will continue to add future volumes to this series. For those who haven't read any of Surviving the Evacuation, start with Book 1 and I expect you'll be hooked, too. I eagerly await each new offering in this series, NEVER have I been let down. 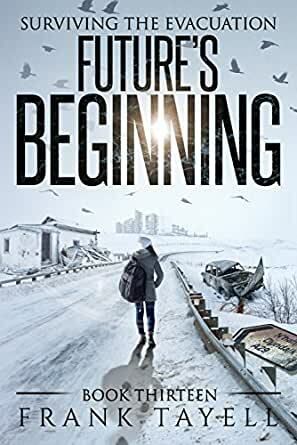 Future's Beginning is another great offering in this series, and while it could probably be read as a stand alone, I think you'll get more from it by reading the series. LOVE this series!!! I like the change of settings in this book and the new struggles the characters are facing. The tensions are all about the new landscape and what happened when the saboteurs struck. Still...what happened to Bill?! 4.0 out of 5 starsStill enjoying the adventure. The author has done a great job of identifying problems and solutions without seeming dreary. The lead characters are well drawn and respectable. Hope is always illuminated as well in this post apocalyptic world. I just love the main characters. I hope there's another book soon. I want to know what happened to Bill. I hope they find somewhere to settle soon & rebuild.